Sustainability, personalization and comfort are some of the key points of this project: a shipping container house, with Andalusian flair, of a young family. Builder: Construcciones y Contratas Cabello S.L. Located in a beautiful Cordoba, this two 40 ft HC and two 20 ft HC shipping containers home in Spain is a functional and sustainable home that can grow and evolve with the family and that, in the future, and if necessary, can move to another location. Those were, among others, the reasons that led Marta and Alvaro to decide on a construction from recycled shipping containers. "Working with containers allows us, on the one hand, the work in the workshop and, on the other, to lower the costs derived from industrialization without this being at odds with a suggestive architectural design. In addition, we reuse parts that are no longer suitable for maritime transport, but which are a valuable element from the architectural and constructive point of view to give solution to certain situations," say architects from Tercera Piel Arquitectura. 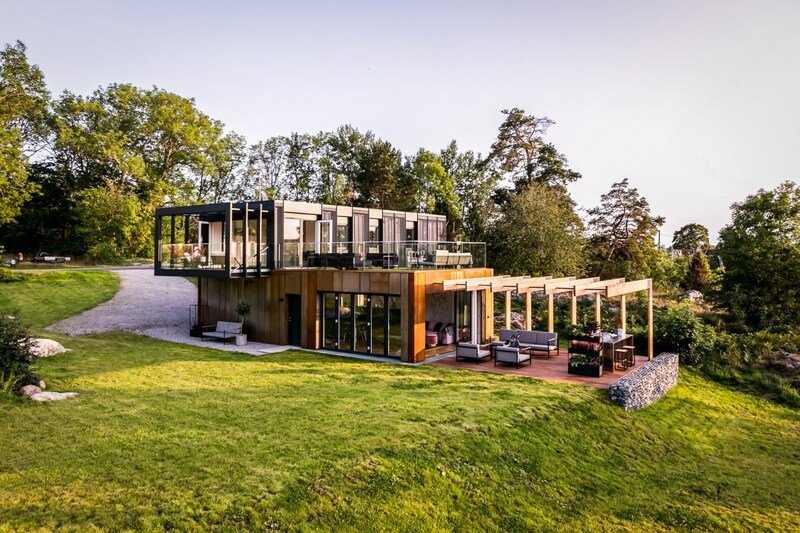 Composed of four sea shipping containers - two containers 40 'HC and two 20' HC, the house is arranged on a floor that protrudes 5 cm from the natural terrain and on which the containers are directly supported. "We have looked for a clear and simple volumetry. In addition to not hiding the containers we tried not to generate encounters that supposed an added cost in the execution ", explains Francisco Carmona. The house consists of a living room connected to the kitchen and two bedrooms with their respective bathrooms, all arranged on the ground floor. The living area has been designed to double height to give a greater sense of spaciousness both to this space and to the office arranged as a loft above the kitchen and that opens onto it. This area of the study, which is accessed by a light metal staircase, is also leading to the roof projected as a terrace and arranged over the bedrooms on the ground floor. The double-height floor slab has not been totally disassembled, but the panel and part of the beams at the base of the container are eliminated to avoid the twisting that occurs during assembly and disassembly. In addition, these also offer a practical solution for the lighting in the room. Also the excess sheets that were accumulated throughout the construction process find a practical use. Here they have served to create the distributor of access to housing. Arranged next to the kitchen, the contrast between the recovered old door from the demolition of an old church with the metal sheet of the containers that has been preserved as a separation in this area draws attention in this space. The rest of interior finishes has been made in plasterboard panels. The kitchen, a clear and functional space, opens into the adjoining room through a large window. The window can be opened or closed by an ingenious system of pulleys. In this way, despite maintaining eye contact at all times, you can prevent the passage of smoke and odors to the rest of the house when necessary. The wide bar that connects the kitchen with the living room, with an envelope flown towards both rooms, can also function as an improvised dining table when necessary, thanks to its great capacity and the fact that it has seats on both sides. The wooden floors, the originals of the containers, treated to give them their current decorative finish, confer a note of warmth to the environments, of eclectic atmosphere thanks to the mixture of old pieces with others of contemporary design. Without forgetting elements of an industrial nature, such as stools in the kitchen or standing lights that are used as ambient lighting. The numerous openings to the exterior contribute natural light to the house, designed according to sustainability criteria. "In our different studies and proposals for containers, for the visible or hidden skin conditions we used one constructive system or another. For the visible skin, as it is the case that concerns us, it is used (from outside to inside): exterior treatment from white ceramic paint that allows a cooler wall - an important condition in this case due to the high summer temperatures in the area, the container wall itself, air chamber, multi-reflector sheet for thermal insulation, mineral wool for acoustic insulation and a gypsum cardboard backing system", explains Francisco Carmona. For the non-passable roof, acoustic and multi-reflective insulation plasterboard and, on the outside, a steel reinforcement mesh, expanded polystyrene, waterproofing sheet and gravel finish have been used. The walkable roof uses a similar base, with an easy maintenance ceramic tile finish. The mixture of recovered elements - like the pallet that houses the doormat at the entrance of the house - with old and unique pieces, the result of the owners' passion for antiques, is a constant throughout this project. The house is developed mainly on the ground floor, composed of the two largest containers, which houses the living room, kitchen and two bedrooms with bathrooms, all of them with direct access to the outside. On the upper level, a study has been located through which you can access the roof terrace, arranged over the sleeping area. "This project has the added value of serving as a prototype and laboratory for testing systems, materials and constructive solutions," architects from Tercera Piel Arquitectura say, to add an interesting reflection: "working architecture as a process is one of the added values that for us in this project; return to those origins in which the difference between architecture and construction was not easy". 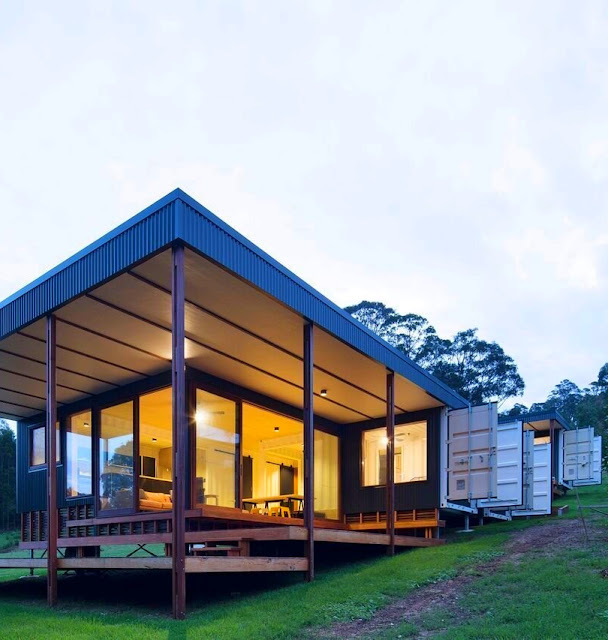 Low-Cost and Stylish Shipping Container Home, NSW, Australia. 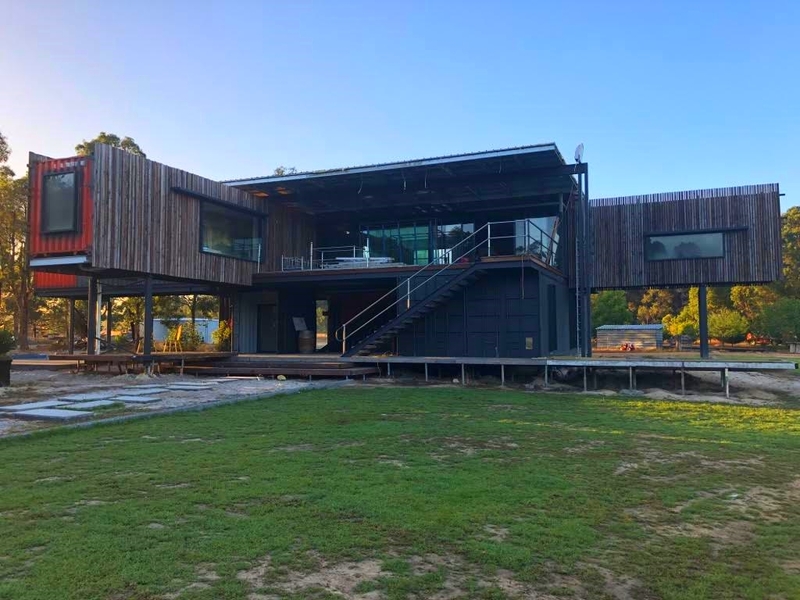 Tailored for the gently sloping block with the street to the west, good north aspect and bushland views to the east, Matt’s design centres around one 40-foot and three 20-foot shipping containers. 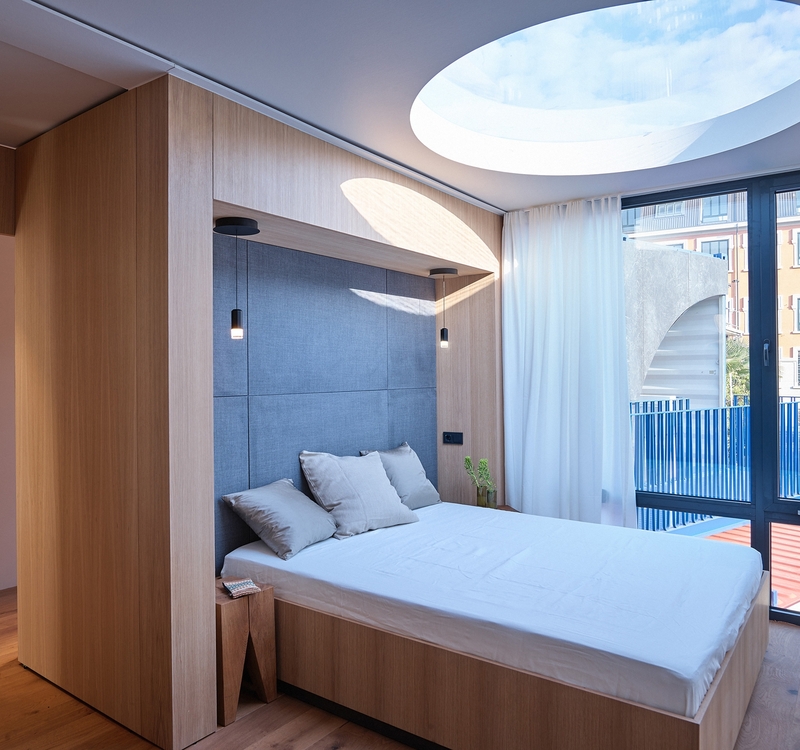 One of the small ones forms a separate guest pod; the other two host modest bedrooms and are arranged to form an L-shape with the long container, which houses a bathroom, bunkroom and kitchen. A sunken lounge nestles into the corner of the L, and is surrounded by an extensive covered deck providing extra living space to the north and east. The layout of Simon and Elise’s house allows the containers to take care of the smaller spaces and service areas, and steps down to take advantage of the fall of the land to create generous ceiling heights for the living room and decks. 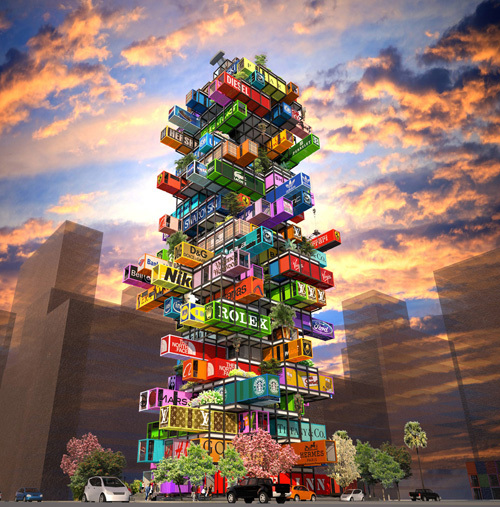 “If a shipping container is to be a good strategy for a building, it needs to really pull its weight. For this build, the containers minimised the need for structural walls and posts for three-quarters of the home, and allowed us to keep the roof structure pretty simple.” He explains that using the containers also reduced the build time and associated costs. Other strategies for keeping costs down included a minimal footprint – the house and guest pod together are only 94 square metres, plus 40 more of decking – and a focus on structural efficiency and a restrained form. Material choices were inexpensive, like the structural ply used for floor, wall and ceiling linings, and there’s a certain roughness to the finishes; for example, screws were left exposed. Designing the house to follow the slope of the land allowed for a simple subfloor structure and no excavation, also a significant cost saving. This project was always about economy, efficiency and how to do as much as possible on a very limited budget. However, the scale belies the efficiency of program and generosity of the outcome. The client’s conviction from the outset was that good architecture does not need to be expensive, and this project attempts to prove the theory. It is modest in budget (approx 1/3 of the cost of the any other new house undertaken by the office), and also in scale (94m2 + 40m2 decks). The house can sleep 10, and feed many more. Structurally it is built around 4 containers, with a flat roof and insulated external cladding for thermal performance. The containers are exposed internally and house sleeping and service functions. The floor and decks step down with the site to create generous ceiling heights, views down the block and connection with the ground at all points. Environmentally, this house attempts to do as much as possible to minimise its impact including : north orientation and zero excavation, zero VOC finishes, natural wool insulation in roof, 100% recycled HW doors and windows with Low E DGUs and 5000L on site water storage. Cost: Materials and 20 ft HC container are around $20k CAD. 250 labour hours. The place, which has its first season in Berlin Mitte in 2014, really offers space for hungry guests, especially in the summer months, when you can sit outside on the terrace - and that usually ends when the cows come home, So at the time of Almabtriebs. The cows themselves are also inspired by the name of the cows themselves, who spend a lot of time grazing - according to the enjoyable Slow Food concept, which only provides vegetarian dishes. In a classic cargo container, designed by Natalie Viaux and equipped with Norwegian birch furniture with copper accents, the alpine pasture theme is also emphasized with corresponding images. The restaurant is currently on winter break - but soon the cows will dare to go back to the pastures! 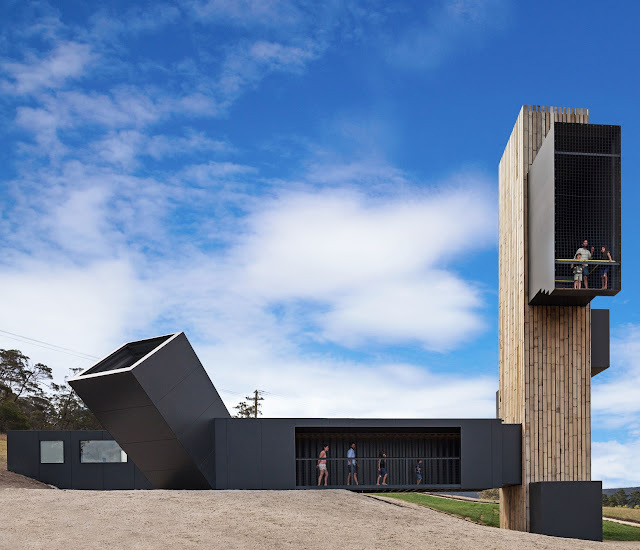 For the Brown Brothers winery in Tasmania, Devil's Corner, Cumulus Studio designed an outstanding ensemble in the truest sense of the word. A cluster of buildings includes viewing platforms, a food stand and the door down to the wine cellar. As a building material ship containers were combined with wood. For a long time only a collapsible building protected the door down into the wine cellar. Now, a new solution was sought. The spectacular shipping container building also serves as a tourist attraction and as a place for tasting the wines produced there. The entrance to the cellar, with rooms for tasting, a shop and tourist information, circumscribes the inner courtyard, which is used for changing events. Protected by a large awning, it also serves as a haven of tranquility and invites you to linger with seating. Three interlocking shipping container structures, two lying and one tower, form the building. Selected, framed views make it possible to visually discover the landscape - the sky, the horizon and the bay at the foot of the vineyard. The tower culminates in an open observation deck. Visitors can thus get to know the wine through culinary and visual references. A total of ten shipping containers were reused for the buildings - five of them for the lookout and another five for the rooms around the courtyard. The rest of the supporting structure was also realized in steel. The choice of materials offered above all the advantage of industrial prefabrication. Thanks to their module size, the containers are easy to transport and, thanks to their stability, can also be used flexibly. Often, the architects only used parts of a container or put two slices together like the lookout tower. Adapted to the new usage, they were quickly assembled on site. In addition, a prefabricated staircase made of steel plates winds up in the lookout tower, breaking through the wooden shell of the building. This results in viewing axes in varying directions and the supporting material is visible to the outside. In the wooden paneling, the reference to a traditional farm suggests itself, which is also demonstrated in the loose arrangement in which the buildings are located to each other. As with a rural settlement, although the individual parts resemble each other in their aesthetics, they could each equally exist for themselves. The architecture of the Devil's Corner winery plays with the contrast of natural materials and the repeatedly translucent references to the industrial origin of the supporting structure. Shipping Container Modular Smart Building Concept with Plug-In Mobile Rooms that Can "Travel"
OVA Studio presented their competition entry for the 2014 Radical Innovation Awards. This is a shipping container modular smart building concept with plug-in mobile rooms that can "travel" - the room to go. OVA wanted to create maximum flexibility and mobility with this mobile rooms concept HIVE-INN. That's why their choice fell on the cost-effective container design, as the containers are easy to transport and similar to lego blocks stackable and modular expandable. Similar to a suitcase, the ready-made container could travel and be sent to the desired location or be used on the spot as an exhibition area or as an advertising space for companies. It would also be reasonable that the containers are rented for this purpose. The basic framework is based on a steel grid, in which the respective containers are pushed by means of a crane into the existing cassettes - similar to a plug-in system. So the building can individually grow or shrink and adapt to the demand. At the HIVE-INN the OVA Studio designed two container rooms for Ferrari and Alexander McQueen. 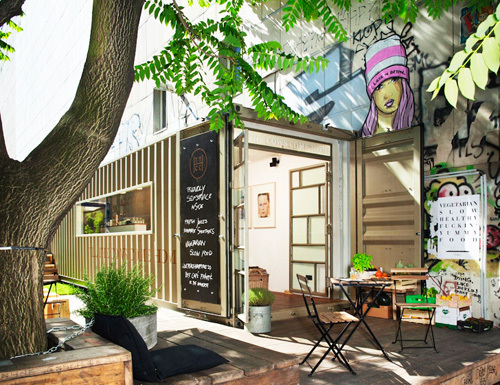 Sea freight containers make comfortable living space: the company Containerwerk has specialized in this unusual way of reuse, not least thanks to an innovative shipping container insulation process. The Stuttgart start-up buys used, discarded freight containers for this purpose and is expanding their shell and interior into functional, stylish living space. Several modules can be connected to entire residential shipping container buildings, and other types of use are conceivable. The lifetime of a common freight container is on average 13 years. After that, the mass is just scrap metal. The start-up Containerwerk, which was founded in 2017, aims to meet a whole range of current challenges by converting used large-capacity shipping containers and processing them into inexpensive, ready-to-move-in residential shipping container homes. These challenges include housing shortages, lack of space, waste of resources or environmental pollution. The founding of the company was preceded by long development processes, which were developed, among others, in cooperation with the German Sustainable Building Council (DGNB) and the Fraunhofer Institute. As a result, a fully automated, multi-patented process was developed, enabling monolithic, thermal bridge-free and slim high-performance insulation for the container shell. Even if the idea of ​​conversion for freight containers is not entirely new, functionality and series maturity were preceded by decisive development steps. Over the course of many years, shipping container insulation processes had to be tested, which ultimately resulted in an innovation and the founding of the Stuttgart-based company. Ultimately, polyurethane foam is used, which is extremely difficult to process, as one of the founders Ivan Mallinowski explains. "The temperature of the wall must be exactly right. If it is too cold, the foam will retract and not foam enough. And if it is too warm, it foams too much and sticks. We made many attempts, including with BASF, and found that it must be applied at exactly 19.3 °C for everything to work. Plus, it has an extremely short second-by-second response time where it needs to be right where it should go." This led to the task of processing a polyurethane foam three-dimensionally fully automatically and installing it as a monolithic shipping container insulation in a unit. With the help of the Institute for Fuel Processing at RWTH Aachen University and a plant manufacturer, a corresponding polyurethane plant could be produced. Together with the second company founder Michael Haiser, the starting signal for container production and the serial production of residential shipping container homes on a large scale, which today takes place at the production site Wassenberg near Düsseldorf, followed. Within a certain framework of their original morphology, there are no limits to the stylistic limits of the modules. On the occasion of the Milan Furniture Fair 2018, the company together with partners presented possible forms of their microarchitecture in several installations. Not only the diversity of the façade design or the degree of high-quality interior shipping container homes design became clear, but also the possibilities to configure modular ensembles to whole buildings. Since the individual cuboids can be variably connected in the horizontal and vertical, individual multi-room solutions can be created. Due to their low weight, the blocks can be stacked, but also integrated into existing building structures. The short construction time, transportability and cost-effective design seems to be a reasonable solution for temporary or permanent living space concepts. In addition, the manufacturer also promises other types of use. 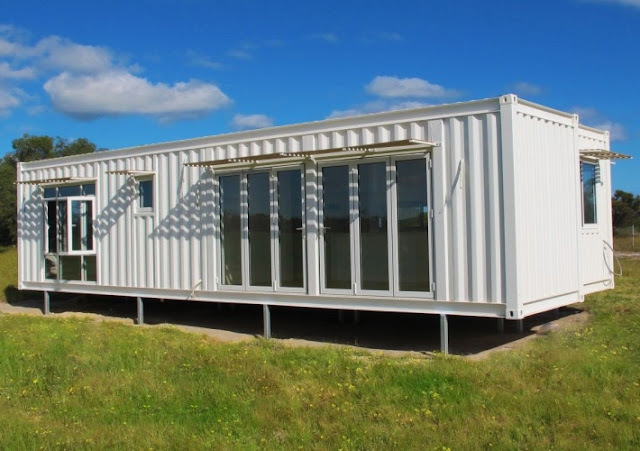 From the office room to the hotel, boarding house or dormitory, to the elderly facility or even rehabilitation clinic, shipping containers can be converted. The new concept of energy and raw material efficiency is also a long-term commitment: With its innovative insulation technology, the microarchitecture is above the EnEV standard. All materials used can be sorted at the end of the life cycle of the container and 100% recycled. And since usually mobile point foundations are sufficient, the plot is spared and cleared without residue. A promising concept that has already won numerous awards in its early corporate history. Containerwerk emerged as the winner of the Green Product Award 2018 in the category of architecture, was named one of the 100 most innovative companies in Germany by the initiative "Germany - Land of Ideas" and was selected by the GreenTec Awards, which are the world's best projects in the area Environmental and resource conservation, with two finalist titles honored: in the category "Construction & Living" and with the start-up special prize 2018. Just outside Norrtalje in Soderbykarl we can find this beautiful 4x40 ft shipping container house with internal insulation and double-skin facade in rural and picturesque setting. Here sheep occupy the closest neighbor and create unique contrasts where industrial styling meets nature. The building serves as a sculpture in the landscape, yet it fuses well with the rural surroundings. This unique architecture is created with four shipping containers, which in a creative and tasteful way now offer accommodation beyond the usual. To complement the shapes and colors found in the local area, the top-floor containers are covered in powder coated stretch metal, while the lower level is covered by Corten plate that gets rusted over time, completely free of maintenance. In addition to the impressive exterior, this is also a house of the highest quality even inside. The home is automated via FIBARO, where you control the lights, heat and lights via phone and keep track of movements and smoke detectors that alarm directly to your phone. There are also multiroom solutions for sound with built-in speakers on both floors, which are controlled wirelessly via Sonos Connect. The ground floor offers the social areas we all want and the warm summer days here are the opportunity to open all the glass sections, creating a further dimension of the accommodation. Here, the newly lawned lawn or wooded balcony is beautifully and practically protected by the solid lumber beams. From the patio, however, you have a lovely view of the surrounding area with tranquility and silence. The ground is in a sunny position and it is hard not to be impressed by the beautiful sunset over the beautiful landscape! With an exciting design and unique construction, this newly produced beautiful 4x40 ft shipping container house with internal insulation and double-skin facade offers something out of the ordinary! And besides its unique exterior, this is also a top quality accommodation in terms of design and living standards. - House's upper floor offers own entrance, bathroom, bedroom and family room. - The bathroom is fully tiled in light tones with gray tile floors, large white tiles on the walls and ceiling lights on the ceiling. Here we find shower with glass wall, toilet, sink with dresser and mirror cabinet. Black mixers break nicely against the other white interior. - The large bedroom is well-appointed and accommodates a double bed and plenty of storage behind a wall-mounted wardrobe. Window with a lovely view beyond the lush surroundings. - The smaller bedroom offers storage through closet and holds bed and desk. - The family room is simple with a sofa, coffee table and armchair. From the living room you will find both the furniture balcony and the fantastic and sun-filled roof terrace. The roof terrace is green and comfortable thanks to artificial turf and offers great possibilities for different types of furniture. There is ample space for sitting areas and sunbeds. The glass rails give us an uninterrupted view of the beautiful landscape. - The ground floor is pervaded by a plan solution that allows cooking with a possibility of simultaneous social connections. Here you can open all the glass sections and create a truly wonderful atmosphere with a combined outdoor and indoor environment. In the patio there is a solid wooden deck that offers furniture and shade is donated through large hanging slats. The ground floor offers, behind the staircase, storage through the wardrobe and space for the desk. There is also the technology room. - Cook in nice black tones with all the mechanical equipment you require. There is microwave and oven built in high cabinet, fridge / freezer, induction hob and dishwasher. Sturdy and matching countertop offers good work surfaces and storage is provided by upper and lower cabinet. Natural place for food group. - The living room in the open plan solution offers space for large sofa. A lovely place to enjoy the beautiful scenery thanks to the big glass windows. In the warm days, you can open two walls and get a lovely combination of the outdoor and indoor environment. - The bathroom on the ground floor is also fully tiled and modern with white tiles on the walls and gray tiled floors. There is a bathtub, large chest of drawers with storage space, countertop and a combined washer and dryer. The home is designed to withstand conditions of Swedish climate. The temperature can be as low as -25 during winter time with snow or up to +35 degrees Celsius in summer. 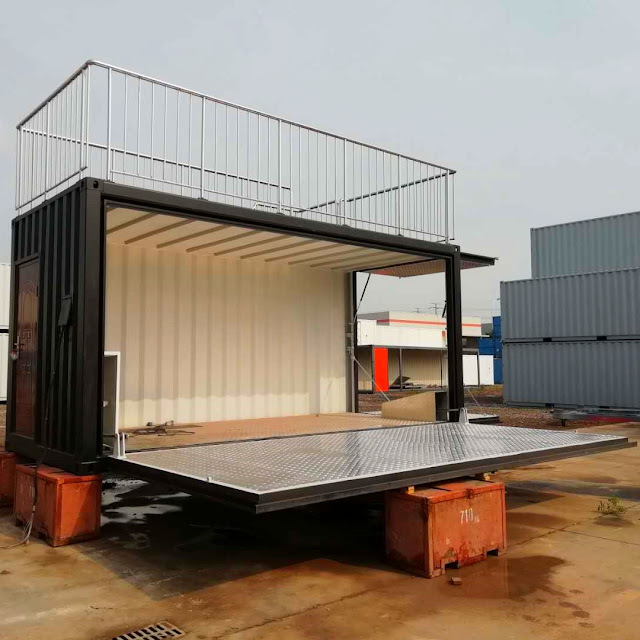 Modified shipping container with automatic hydraulic door can be used for сafe/restaurant, exhibition container, shop or residential shipping container. Hydraulic system for the side opening can be operated by one person with the push of a button. Roof balcony and staircase allow to use additional 160 sq ft (15 sq m) roof area. Stainless steel checkered floor has the features of high corrosion resistance and strength. It is hygienic and attractive for a wide range of applications. The unit can be shipped around the globe, the items contained inside, secure and safe. The cost of this 20 ft modified shipping container with automatic hydraulic door and stainless steel features, is $20 000. Residents, who live with comfort in the first Brazilian shipping container home, are the architect Danilo Corbas, his wife and, of course, his dogs and cats. 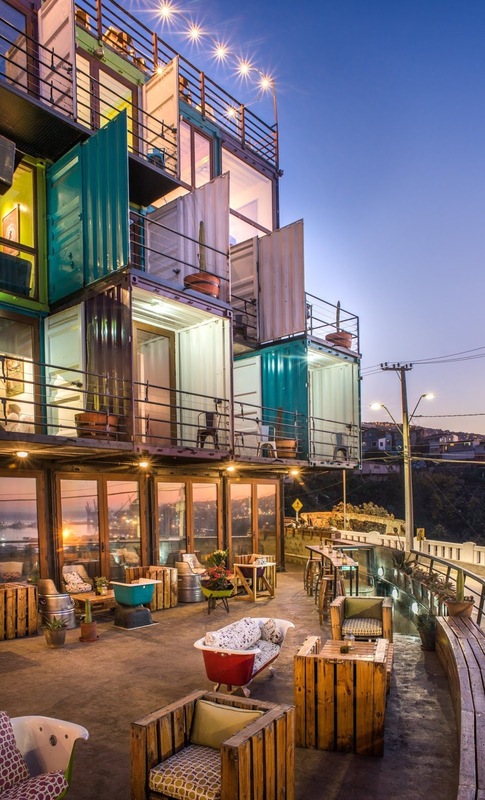 When visiting his in-laws, who lived on a catamaran in Salvador, the architect Danilo Corbas, founder of the Container Box, had his first insight into alternative homes, assembled with minimal spaces and not bricks and cement. From then on came various references, such as the European experiences with containers and a conversation with the wife's father, who worked on oil rigs and often slept in such accommodation. The result: The house Danilo would do for him would be in a container, or rather four. "I was in search of a change of lifestyle, I lived in São Paulo, in the agitation of Vila Madalena, and then I found this land in Granja Viana and only had to negotiate with my wife, who is art director and soon idea! ", says the architect who chose to work with the contrast between the tranquility of the region and the industrial style of his new project - the first of its kind in Brazil. In total, four 40-foot sea containers were used, each one being 12 m long and 2.90 m high. 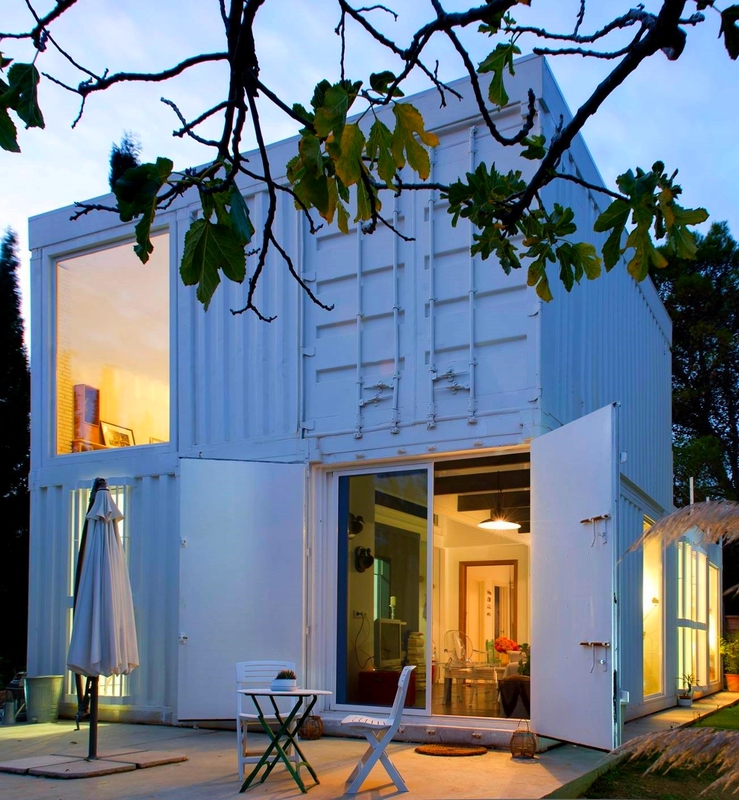 In total the 3 bedroom shipping container home occupies 196 m² of the 860 m² of land. There are two floors in which are distributed three bedrooms, living room, dining room with integrated kitchen, office, three bathrooms, laundry area, covered garage and balconies. In addition to its innovative character, the project also has a sustainable appeal, since it uses obsolete containers, reusing a material that is difficult to dispose of and saving resources such as sand, brick, cement, water and iron - which consequently reduces the amount of rubble generated by work. The container house still encourages, at least indirectly, the increase of the green area, since to plant trees around the house and to install a green roof, actions are almost necessary to ameliorate the heat conditions caused by the structure. With this in mind, the project still takes special care with windows to ensure cross ventilation of the house and decrease the use of air conditioning. Already when the subject is style and decoration, the 3 bedroom shipping container home asked for an industrial décor and it was not a problem. According to Danilo, his only regret is not daring more, "today I think we could have used less coating and left more parts of the structure to show," says the architect who developed all the techniques for executing the project from scratch and today is a specialist in which has already finalized about 10 other projects of the type. Description by the project team. Located in a land of 860 m2, in a residential condominium in Granja Viana, in Cotia (SP), the shipping container house has 196 m2 of constructed area, distributed in two floors. There are 3 bedroom, living room, dining room and integrated gourmet kitchen, office, three bathrooms, laundry area, covered garage and balconies. 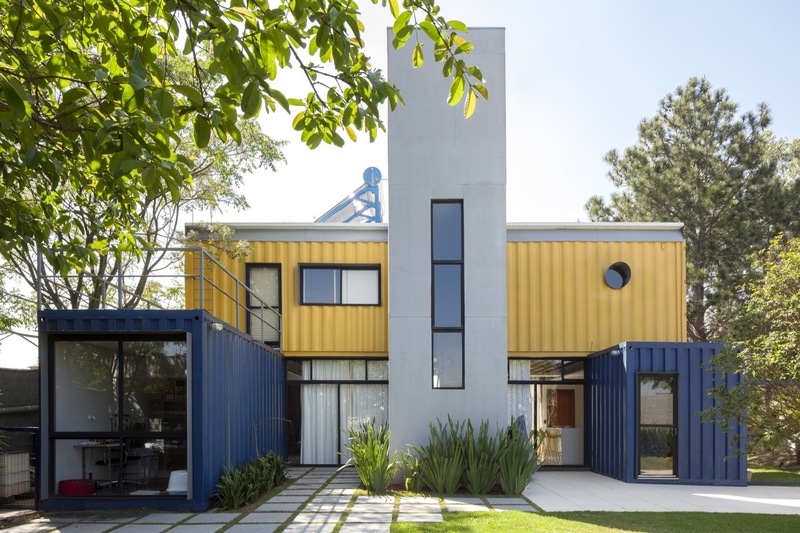 Reuse of materials for house structure: disused maritime containers. Besides using discarded noble material, the use of container generates savings of natural resources that were not used for the structure of the house, such as sand, brick, cement, water, iron etc. This means a cleaner work, with reduction of debris and other materials. Economy in the foundation and reduction in the use of materials. The light weight of the metal structure allowed the use of light foundation, small and shallow. Preservation of trees on the ground and landscape design to help shade the building and minimize excessive heat. Reuse of rainwater. It will be captured by the roof, stored and filtered in its own reservoir, for use in garden irrigation, external cleaning, car washing and washing machine. Cross ventilation. Windows and openings will be used to avoid the use of air conditioning, one of the major consumers of electricity. Green roof. Part of the cover will have vegetation to aid in the thermal insulation of the container. Polyurethane sandwich panels, for better thermal performance of the house; in white color to reflect the solar rays and contribute to the temperature decrease of the local microclimate. Energy efficiency: use of lighting in LEDs. Avoiding waste. Metals manufactured by Roca with flow limiters and water temperature, which prevents waste by up to 50%. Use of PET insulation, thermal insulation made from PET bottles, from Trisoft, which received the "Planeta Casa 2010" award in the building materials category. Eco-friendly paint: water-based paint, unscented, manufactured by Sherwin-Williams, with low VOC (Volatile Organic Compounds). The Lindendale is a luxury shipping container home that has been inspired and designed by a local client. Configured with 14 X 20 FT shipping containers, it has top end fittings and finishes to contrast the bold look of the containers. 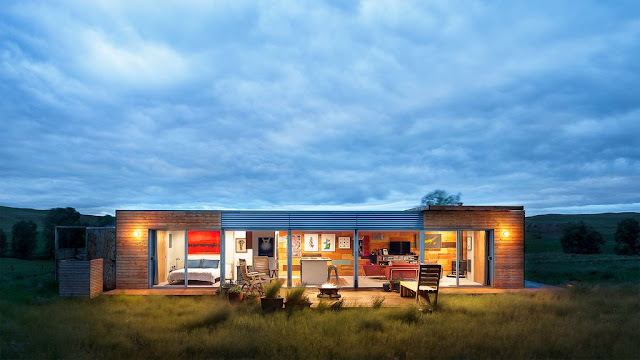 But shipping container homes are not confined to just one look. You can turn it into any style you want. You can make it look trendy, simple, luxurious, modern, sleek. There is really no limit to what you can do with customized container homes. Shipping containers in this tropical island house in Lombok (Indonesia) appears to be slipping away from the rooftop of the residence. Clay House is built on a green hill in a beachside area Selong Belanak, in the southern West Nusa Tenggara province of an Indonesian Lombok island east of Bali. The tropical island house is made up of two volumes set on concrete pillars to rise above surrounding tropical landscape and face towards the beautiful Indian Ocean. Seven Havens Residence is the name was given to the house by the owner. The surroundings are currently undeveloped and architects say the shipping containers island house will be become a landmark in this place. 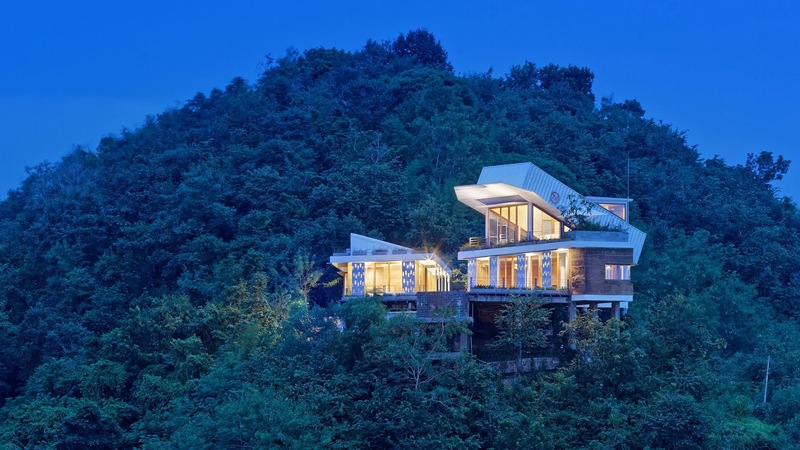 "In the presence of this location on the hill of course we have to be careful because this building will automatically become an icon of the surrounding environment," said the Budi Pradono architects. Two shipping containers are placed at the highest point of the building, and are angled upward at 60 degrees to create a large space in the master bedroom. High ceiling allows a big window with glass doors that open to a wide terrace. The exterior of the tropical island house is painted white to reflect the sunlight and avoid overheating of the building constructions. The shipping containers were sourced from a sea port of a nearby island; the containers still bear a "7h" orange logo. Building materials are cheap and local sourced. The clay for the walls was collected in the Lombok island, 20 kilometres from the building site and treated with a mixture of cement, sand, cow dung, and straw. To prevent overheating in the humid and hot climate the walls were built 30 centimetres thick. Internal cladding was made using flattened bamboo. To make most of bamboo starch stay in the plant roots, the bamboo was harvested at night when no photosynthesis process was taking place. Bamboo then underwent a preservation process, which included submersion in a salt sea water for 60 days and after this a coating of paint. Other exposed natural materials were used throughout the tropical island house to complement the interior, like stone tiling and heavy wooden furniture. The Kaloorup Shipping Container House is a project that Steve Hick is undertaking in the south west of Western Australia. Nine 40ft containers are being used for the structure. Recycling where possible using native hardwoods (Jarrah) for cladding and decking. The cladding and darker tones are being used to help the house blend in with the surrounding bushland. Large double glazed glass panels are being used where possible to retain warmth through the cooler months and secondary colourbond roofing to act as a second skin protecting the inhabitants from unwanted heat transfer in summer. The project is the first legal container house structure in the southern capes Margaret River area and is close to completion. 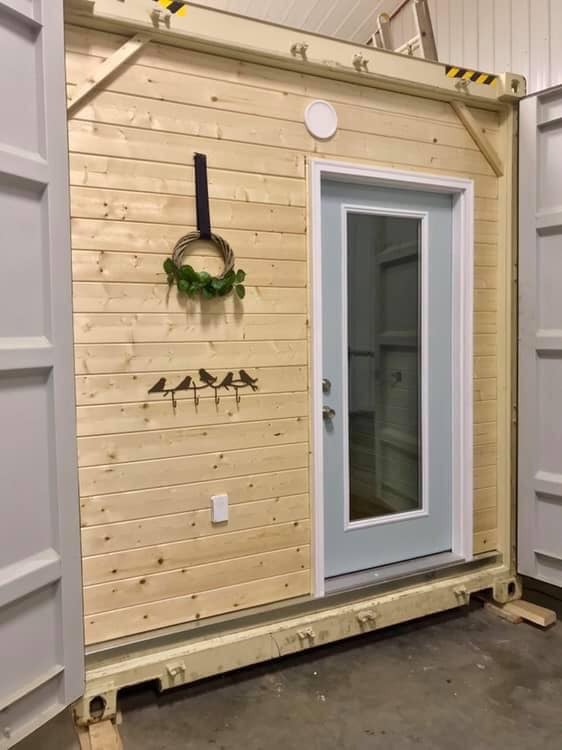 Alternative Living Spaces designs and builds simple and luxury shipping container homes targeting customers who want a cozy backyard unit to use for additional rental income or people looking to use a shipping container home as a guesthouse or luxury primary residence. Container home price starts at $36,000 and includes 20 ft shipping container. Interior design can be completely customizable. 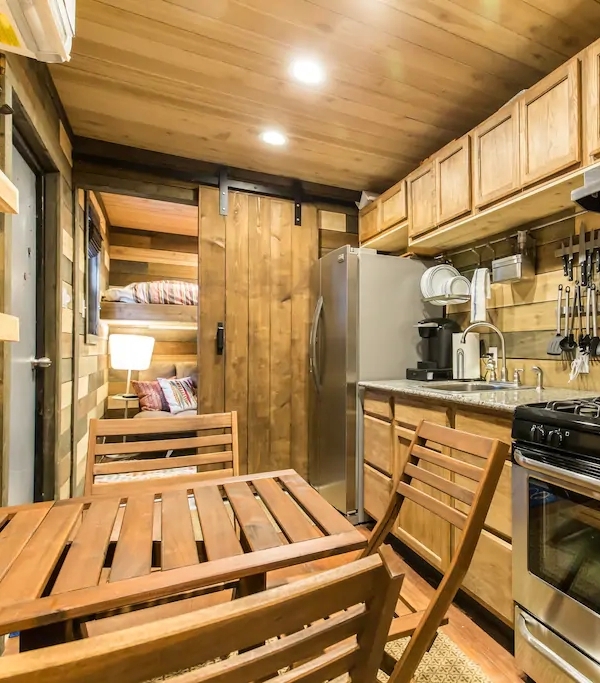 Usually container units feature a kitchen, a bathroom with shower, some sort of dining and work space, and a living room that can be converted into a sleeping area. First 20 ft shipping container house in Sacramento, CA is currently being used full-time. Deer artwork hides a wall bed (Murphy bed) that stores vertically and drops down horizontally to create a large sleeping area. 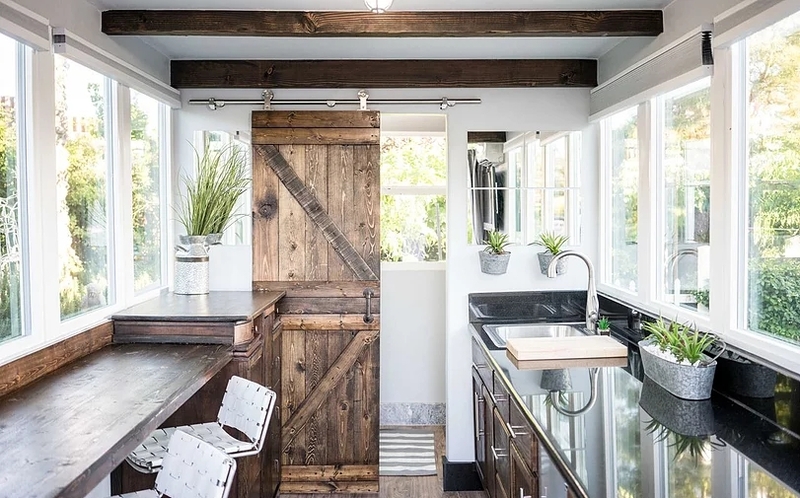 Several storage and space-saving hacks (for example a pole to hang clothes under the desk) make the tiny 20 ft shipping container home seem much larger despite its 165 square feet. Wooden celining beams and 11 windows help to transform the industrial shipping container from standard metal box to cozy tiny home. Convenient doors that open 180 degrees and full-height glass bring the light and air from outdoors in. Heating and air conditioning makes living in this 20 ft shipping container home comfortable in any climate. This project is the first new build office to be approved with shipping containers construction within a Conservation area in central London. The containers are sprayed hues of red and yellow to match the original glazed bricks of the surrounding Listed Buildings. Simon Astridge (on the project): "I want my clients to walk into a space and not be able to keep their hands in their pockets. I want them to touch the different hues, textures and colours of the tiled products. I want them to run their fingers over the walls and the floor. The porcelain gallery project allowed us to achieve our goals of sensorial architecture. Attention was paid to encompassing the rich history of Hatton Garden within the design, with the use of shipping containers representing the industrial heritage through to smaller details such as the antique light fittings and custom display cabinets designed to mimic and communicate the significance of the jewellery workshops still prevalent in the area. 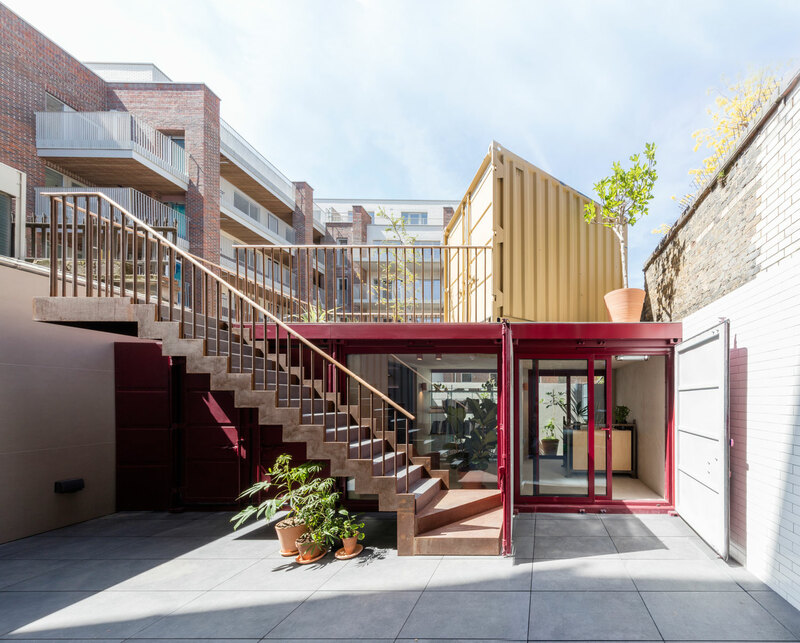 The project is rooted within its context by orientating towards a mature locust tree and with the colours of the shipping containers taken from the surrounding grade listed buildings and classical red and yellow hues of London brick. Our celebratory concept for everything the visitor touches to be clay starts as soon as they enter the gallery with the gentle touch of the ceramic buzzer, this concept extends throughout the project with everything from the extruded stair handrail to the slender door handles being made from 100% natural clay. We meticulously designed all the pieces and their unique glazes with our ceramicist Emma Louise Payne." Urban Rigger is a unique, design protected, patented, floating, flexible, CO2 neutral and mobile property totaling 680 m², which is spread over 300 m² of housing (9 + 3 individual student residence a respectively. 23 m² – 27 m²), a 160 m² common green courtyard, Kayak landing, Bathing platform, BBQ area, as well as 65 m² communal roof terrace. Downstairs below sea level, the 230 m² pontoon (basement), Comprising: 12 storage rooms, technical room and common fully automated laundry. Designers utilize up-cycled shipping containers to create floating shipping container home. Shipping container is probably the most optimised infrastructure on the planet. The container system is a uniform system that is used in every continent. Shipping containers are accessible everywhere. The problem arises when shipping container reaches the end of its lifecycle. Depending on global steel prices, shipping containers are either abandoned or melted down. If shipping container is melted down, it will have consumed 8.5 megawatt in its life cycle. So instead of recycling, we are banking on up cycling. In other words, continuing the container’s life cycle in a different way. It costs as little as 450 kilowatts and it does away with the approximately 1,100 tonnes of CO2 required to build a new, traditional home. By revitalizing these old structures we help to maintain a low environmental impact of Urban Riggers. We want to do our best to preserve our natural capital. The material lifecycle perspective is considered in all our constructions, inside as well as outside. Healthy materials are chosen to create a good indoor climate. Our partners and their technologies are playing a key role in generating heating and cooling, while ensuring internal climate comfort and keeping energy use to a minimum. Instead of using traditional, bulky insulation materials, we are using at aerogel, which was developed for space travel and Aluthermo reflective insulation. It is a form of insulation consisting of thin aluminium foil made from recycled aluminium derived from beer and soda cans, for example. 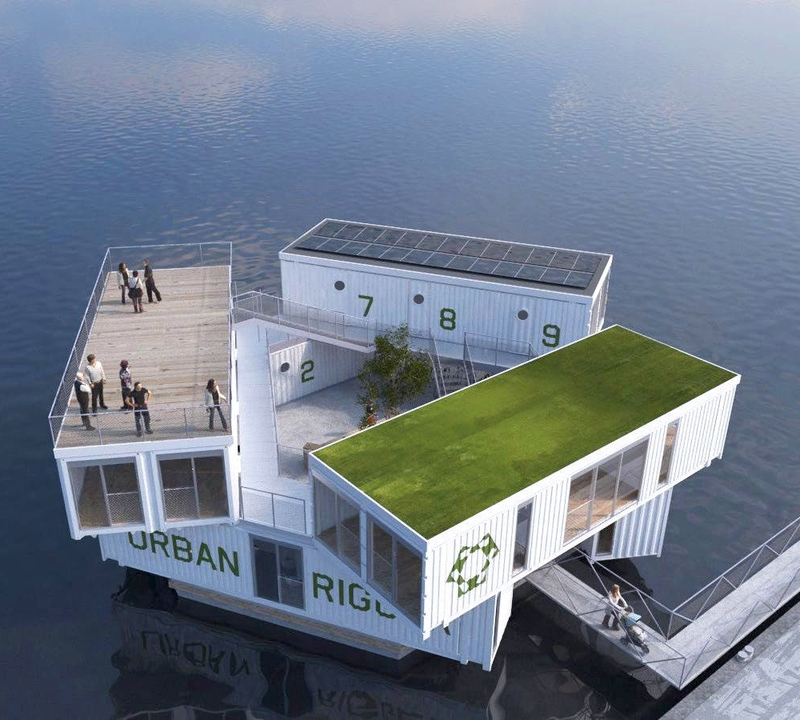 The Urban Rigger floating shipping container home project is primarely developed as student residence. Young people who want to make something of themselves, who have clear ideas about the planet and the future, who want to live close to their friends and their place of education. 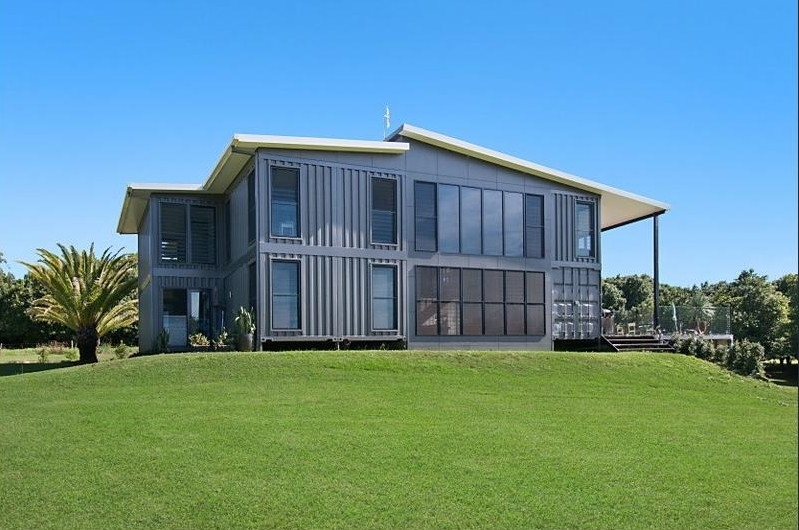 Based on two prefab units or 40 ft shipping containers, joined together to provide a large open living area, this container home can be used either as a normal home or a granny flat, offering very comfortable and functional living areas. The home features 2 bedrooms and 2 bathrooms, full kitchen with island bench, living and meals areas. It’s perfect for two individuals who want their own privacy.